Toyota Hiace Super Long Wheel Base, models average 4 years. 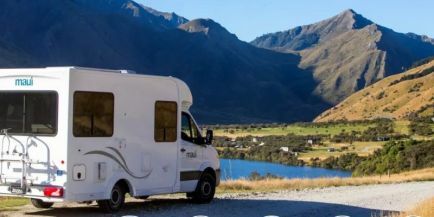 The HiTop is a 3 berth campervan with all the mod-cons like a microwave, fridge and gas stove, plus fold-out table from the inside, for a comfortable and enjoyable holiday experience. The high fixed roof and heated driver's cabin ensure a comfortable holiday experience as it's both economical and easy to drive. Has a Porta Potti. 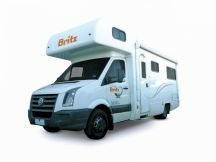 Certified as Self Contained and ideal for freedom camping Has safety fitting for one child seat or booster in rear seat. Get ready for the ultimate adventure holiday. 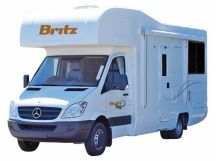 The Britz Frontier has been designed for six adults to explore, live, sleep and enjoy in total comfort. 6 seatbelts. This vehicle has positioning for a total of three child restraints. Mercedes-Benz or Volkswagen models average 4 years. The Venturer is a fantastic option for the couple who want to travel in comfort. With flexible and spacious bed configurations, exterior slide out BBQ and toilet and shower facilities on board it is a true home away from home. Mercedes or Volkswagen models average 4 years, Turbo diesel. Extra features include: Personal Safe / Solar power / External Table / Built in BBQ. The Venturer Plus is designed with you and your growing family in mind! 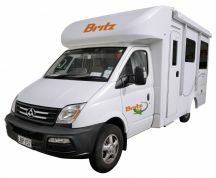 Room for 2 adults and 1 child, this cleverly designed vehicle comes with toilet, shower and kitchen facilities. With automatic transmission, this vehicle is a perfect for an easy family getaway. Mercedes-Benz models average 4 years. Portable tablet with GPS. Seating for a third person behind driver (has child seat anchor point). This vehicle can fit either a child seat or a booster seat. Certified as Self Contained and ideal for freedom camping. 2 bikes can be fitted with bike rack (additional cost). Get ready for the ultimate adventure holiday. The Vista is ideal for four adults to travel with ease and comfort, or four adults and two children. 2 seatbelts in the driver's cab and 4 seatbelts in the main cab. The popular fixed bed in the rear means no setting up and putting away beds – just wake up and go! The fixed awning and DVD player with flat screen are bonus extras to make your trip the best! Mercedes-Benz or Volkswagen models average 4 years. Portable tablet with GPS. This vehicle has positioning for a total of two child restraints. Certified as Self Contained and ideal for freedom camping Hire bicycles may be fitted: x2 (at additional cost). 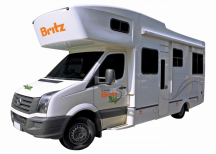 The Britz Discovery model is custom-designed for up to four people. With a dinette that converts to a double bed and drop-down double bed above it, this space saving campervan will be super popular for a family of four or group of friends. The automatic transmission makes the Discovery a breeze to drive. Spend the day relaxing in the campground or use it as a base. 2016-2018 Models. Certified Self Contained and ideal for freedom camping. Up to two child or booster seats can be fitted. Can hire a bike rack and up to two bikes for this vehicle.